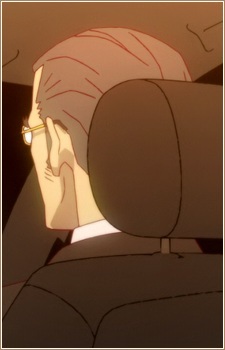 Despite being taciturn, Hitagi's father is kind-hearted and his affection for Hitagi as a daughter motivates him to continue working in the absence of her mother. Despite this, he trusts Koyomi in making sure that Hitagi is safe as he is unable to spend time with her often. He is a part of the Senjougahara family, whose life changed when the young Hitagi was diagnosed with a life-threatening medical condition. Although Hitagi managed to survive the ordeal, Hitagi's mother joined a cult out of desperation for ensuring Hitagi's safety; ironically, this also dragged the mother's attention away from the rest of the family. Years later, when Hitagi was struck by an oddity that left her almost weightless, five conmen who promised to cure Hitagi's condition left the family penniless. Hitagi's mother leaves the family for good since then, leaving behind her husband in debt while he struggles to earn a living for Hitagi's sake.